If any of us has done Judo for any amount of time we have probably done Judo on a myriad of different types of surfaces. I have done Judo on sawdust covered with canvas, to horsehair mats, to wrestling mats to the latest vinyl covered tatamis made specifically for Judo. In our quest for the “perfect” Judo floor, I started to do some research. I had the “let’s do it right” attitude with budget constraints being a major concern. I ended up talking to two structural engineers, a kinesiology specialist, mat manufacturers, gymnastic floor manufacturers, gymnastic coaches and many Judoka on this subject. I must give special credit to James Carmer from Denver Judo who was extremely helpful as he was also doing research on this subject and was great help in the area of suppliers. We both came up with the same conclusion as to the ideal flooring system and surface for Judo. Great minds must think alike. I don’t think anyone will disagree that the tatami mats manufactured by Bridgestone, Swain, Gee, Zebra, etc. 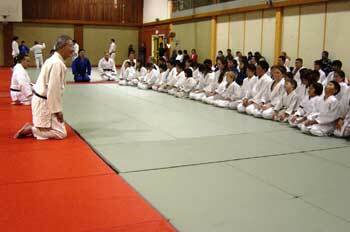 are the best surface for Judo. They are used in Olympic and International venues and are a great surface. I am not too familiar with the puzzle lock, air foam type mats but I have heard and seen favorable reviews for some of those systems also. The sub flooring system which I will refer to as the floor system from this point on was our biggest challenge. The only truly sprung floors I have done Judo on are a hardwood floor mounted on progressive rate springs in Japan and the sprung floors using tires. Our first floor was a tire floor. The progressive rate spring floor was wonderful but ridiculously expensive. The cost estimate to do a floor this way is over $40 per square foot. The springs have a different compression and rebound rate which is very important. One thing I have found is that for a floor to dissipate the impact of a Judo fall efficiently, the compression rate of the floor must be much faster than the rebound rate. If the rebound rate is the same as the compression rate, then the floor system and the mats on top of the surface will only absorb a percentage of the impact as opposed to a floor with a slower rebound rate. Equal spring rate floors are great for basketball, gymnastics and volleyball but not Judo. This is the major inherit flaw with metal coil springs or tires. Using tires as springs poses other problems such as inconsistent spring rates causing hard or soft spots, soft corners, and the general feeling of being too bouncy. Tire floors would be okay if you were using all brand new tires of the same size and make, but how practical is that? After numerous phone calls, emails and in person conversations and then more research; I came to the conclusion that a special polyethylene closed cell foam used in gymnastic flooring and specialized packaging had all the characteristics I was looking for. After numerous calculations were made, I had decided that 2.2 pounds per cubic foot density foam laid out in a pattern of 33 blocks per 4′ x 8′ sheet of ½ inch plywood was the way to go. The foam had the fast compression and slower rebound rate I was looking for. James Carmer gave me a great source for the foam. Of course the gymnastic flooring people didn’t want to reveal their source and offered to sell us the foam at a 5 time mark up. The foam blocks were glued to the sheets of plywood. Another layer of ½” plywood was placed on top with non over-lapping joints between the sheets. The top layer was screwed down to the bottom layer in essence creating a one piece quiet, rigid, non-creaking floor. We tried using Velcro to attach the layers of plywood to each other but we didn’t like the movement or creaking when we did. Velcro was glued to the bottom of the border tatami mats and stapled to the plywood sheets. The mats are tight and do not move. We are extremely pleased with the outcome. Even we old “geezers” are happy to take falls on our new floor. I am extremely grateful to all the advice I received from the numerous sources. We’re gluing the 4”x4”x3” foam blocks to the sheets of ½” plywood. Notice the template on the left that was used for marking placement of the blocks. The girls were very helpful in getting the blocks into place. Here is the plywood with the blocks being laid down with another layer of plywood on top of the first. The two layers are screwed together. Here’s Dave the “screwman” with his power screw driver. The sprung floor is completed. Now the tatami mats have to be put into place. The border tatamis are velcroed onto the plywood. After two hard workouts the mats have not moved. We all love the new floor. Falling is now a dream.